Keep in mind, this will come in a zipped folder. Please make sure to double-click on the folder to unzip it once it has completed downloading. Connect your MPD226 to a USB port on your computer and power it on. Close all other Audio/MIDI software, including Logic, and launch the editor. From the top left of the editor window, select File > Open Preset. 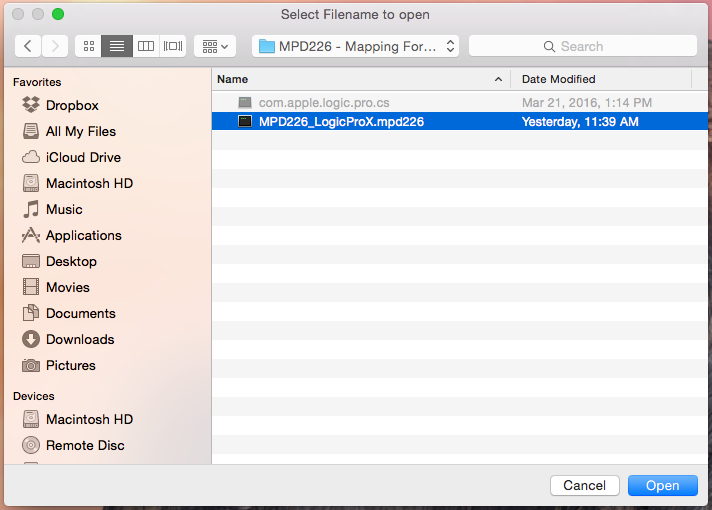 In the window that opens, locate the MPD226 - Logic Pro X Mapping folder and select the MPD226_LogicProX.mpd226 file. A new window will appear. 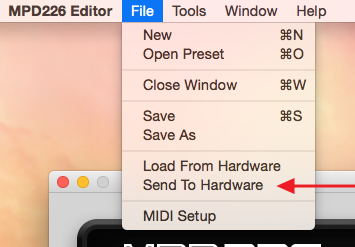 In the new window, select File > Send to Hardware. 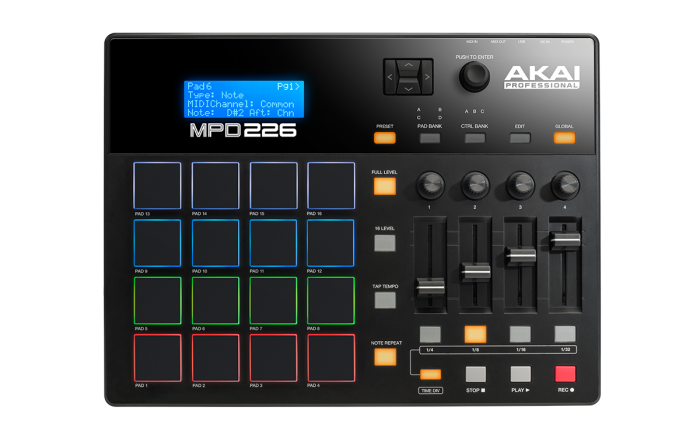 If asked to select your MIDI ports, choose MPD226 Port A in the Output section and click Apply and OK. 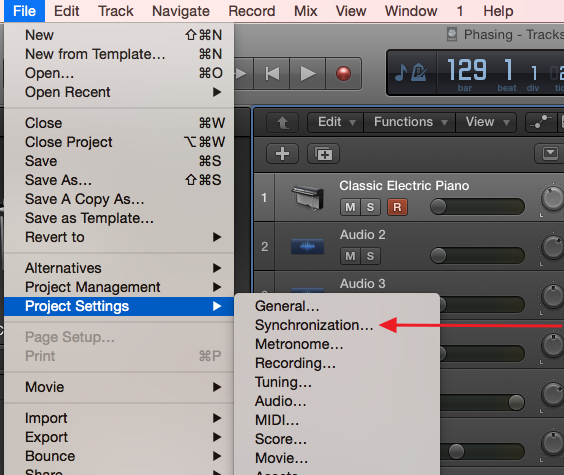 Choose a preset location on the MPD226 where your Logic preset will be stored. It's recommended to choose one of the generic presets (14-20) to avoid overwriting another software's preset. Click Send. Use the scroll knob on the MPD226 to scroll to your new preset number and push the knob in to select the preset. If you were already on the preset number, select a different preset and then go back to the Logic X preset and select it again to load it into the RAM. 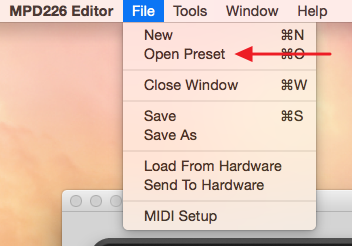 Your preset should now be loaded and you are ready to install the MPD226 control surface preference file! Important: In order to share a mapping profile for Logic Pro X, the control surface preference file must be replaced. This will overwrite any "learned" control assignments previously made in Logic Pro X. Open a finder window and click on Go at the top of your screen. Hold down the Option key and click on Library when it appears in the list. In the window that appears, navigate into the Library and find the Preferences folder. Find the com.apple.logic.pro.cs file in your MPD226 - Logic Pro X Mapping folder and drag it into this Preferences folder. This should replace an existing file of the same name in this folder. If given the option, make sure to select Replace and not Rename. If your window does not look like this and you do not see the listed controls and parameters, try the process above again. Ensure that Logic Pro X is completely closed first and try deleting the com.appl.logic.pro.cs file in the Preferences folder before dragging in the file provided by Akai Pro. 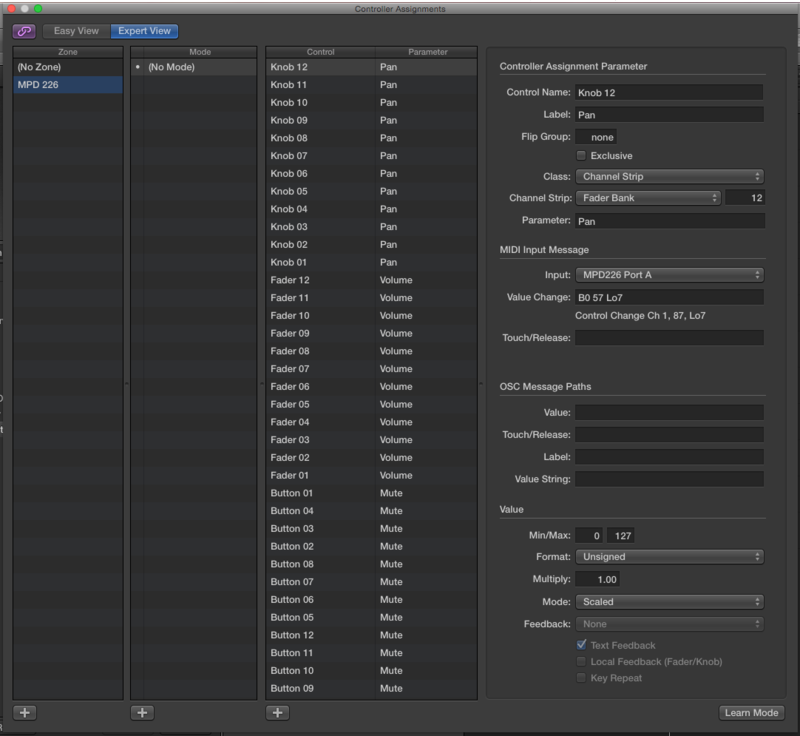 In Logic, select File > Project Settings > Synchronization. Click on the MIDI tab. 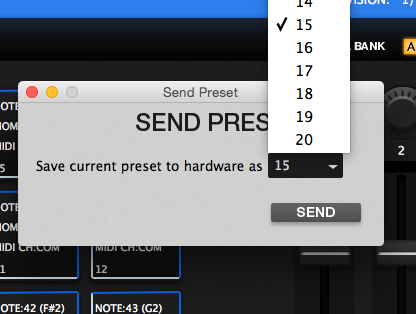 Next to Transmit MIDI Clock, check off the box for Destination 1 and in the drop-down menu, select MPD226 Port A. 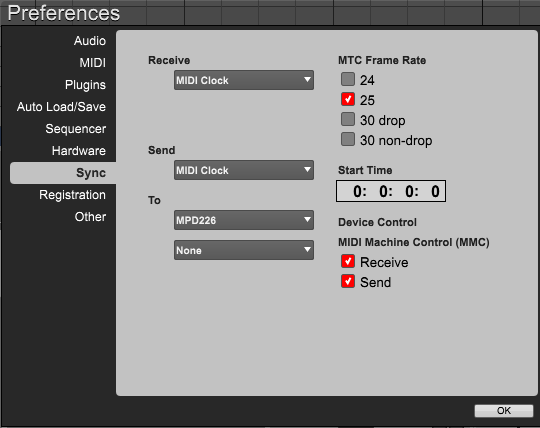 Under MIDI Machine Control (MMC), check off the box for Listen to MMC Input. Press GLOBAL on the MPD226. Use the right arrow to find the Clock Source page. Press the PLAY button to edit the transport controls. Set the Type to MMC/MIDI.